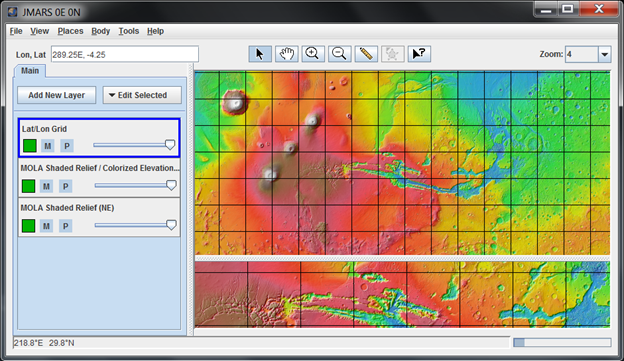 JMARS is used to plan all observations for the Thermal Emission Imaging System (THEMIS) aboard Mars Odyssey. It allows the THEMIS Mission Planners to see where Mars Odyssey will be in the near future, what the surface underneath it will look like and where THEMIS or other instruments have already collected data. 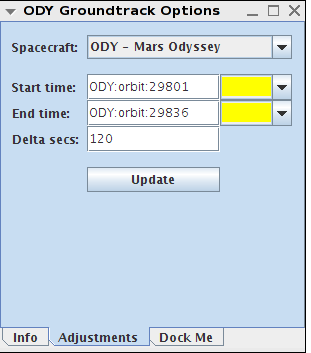 JMARS is also used to plan observations for all the instruments on the Mars Reconnaissance Orbiter and will be used to plan observations for the LROC camera on the up-coming Lunar Reconnaissance Orbiter. 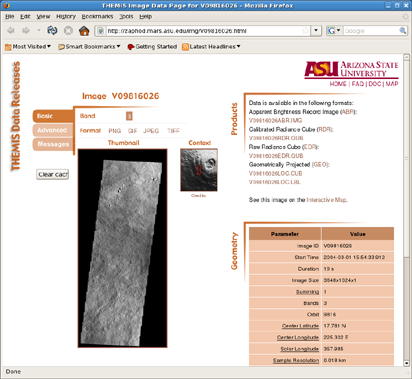 Research scientists, graduate students and undergraduate students use JMARS to analyze data collected by the THEMIS camera, as well as most of the other instruments that have been sent to Mars. Not only does JMARS allow them to view the data from these instruments, but also to combine and compare it to data collected from other instruments. By using multiple data types at the same time, they are able to understand processes on Mars that would not be apparent from a single instrument's data. Since the research scientists and college students have had so much success using JMARS to study Mars, the Mars Education Program would like to make the program available to MSIP teams to use during their projects. We hope they will use JMARS to refine their science questions, analyze their THEMIS images and prepare materials for their final reports. Fill out the registration form. A confirmation email will be sent to the email address you provide. Follow the link in the confirmation email to activate your account. Once JMARS has been installed on your computer, a JMARS icon will appear on your desktop. Simply click on the icon to start JMARS. 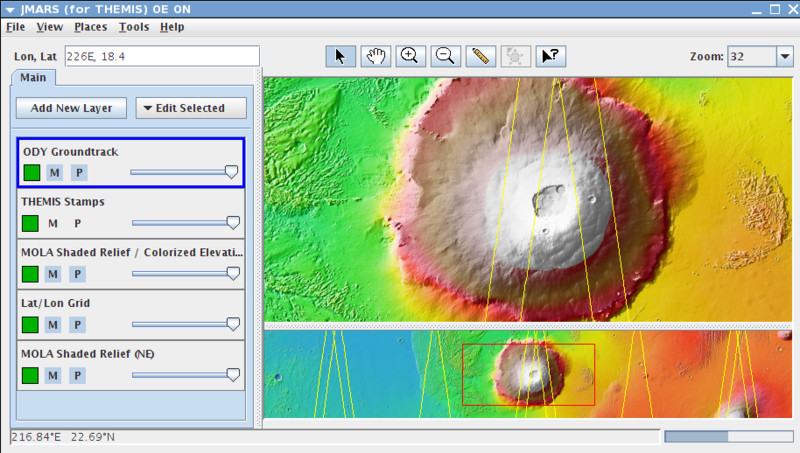 The JMARS program will open in one window that shows the Viewing Window(on the left) and the Layer Manager(on the right). 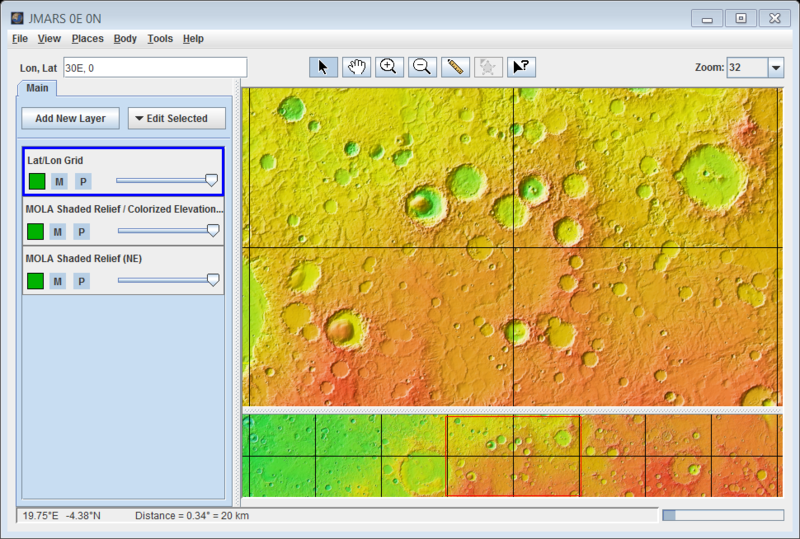 The Viewing Window will show you different maps of Mars and allow you to see what areas the THEMIS camera will be flying over, as well as many other features for more advanced users. 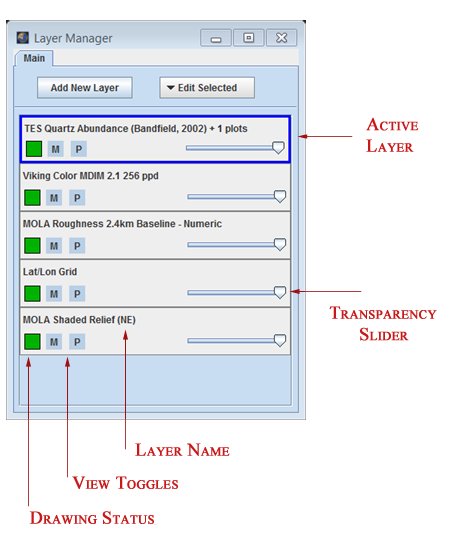 The Layer Manager will show you what is being displayed in the Viewing Window. Much like Photoshop, the different "layers" can be stacked on top of each other and the Layer Manager allows you to re-order the layers. In the Layer Manager, click on "Add New Layer". Select "Maps by Instrument" -> "MOLA" -> "MOLA Colorized Elevation". The colorized MOLA map will be visible in the Viewing Window, but the Latitude/Longitude Grid will not be visible, since the new map was added on top of the Latitude/Longitude Grid in the Layer Manager. 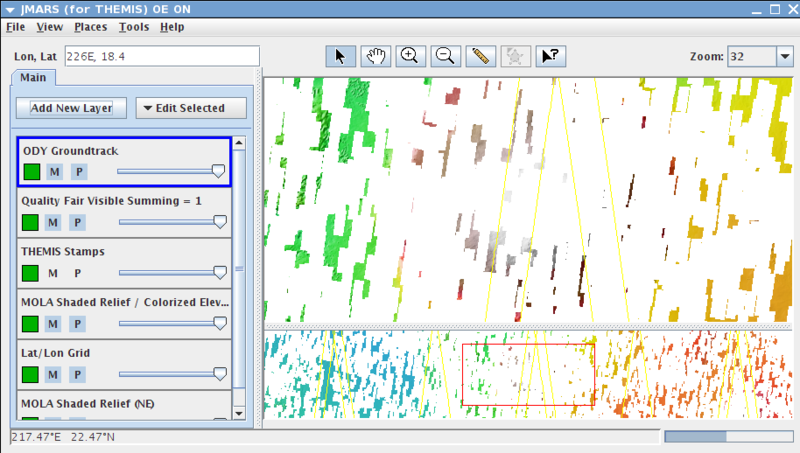 Left-click and drag on "Lat/Lon Grid" in the Layer Manager and drag it above the two MOLA maps. The grid will now be visible in the Viewing Window. If you want to switch back and forth between the two different MOLA maps, click on the "M" button to the left of "MOLA Shaded Relief/Colorized Elevation" in the Layer Manager to turn that map off and on. When you are done with a map and want to remove it, click on the name of the map in the Layer Manager and then click "Delete Layer". To make the remaining steps of the tutorial easier, delete all of the layers from Layer Manager except "MOLA Shaded Relief/Colorized Elevation" and "Lat/Lon Grid". Make sure the "Lat/Lon Grid" is placed above the "MOLA Colorized Elevation" in the Layer Manager so you can see the grid in the Viewing Window. The names of all the officially named features on Mars can be viewed using the Nomenclature Layer. 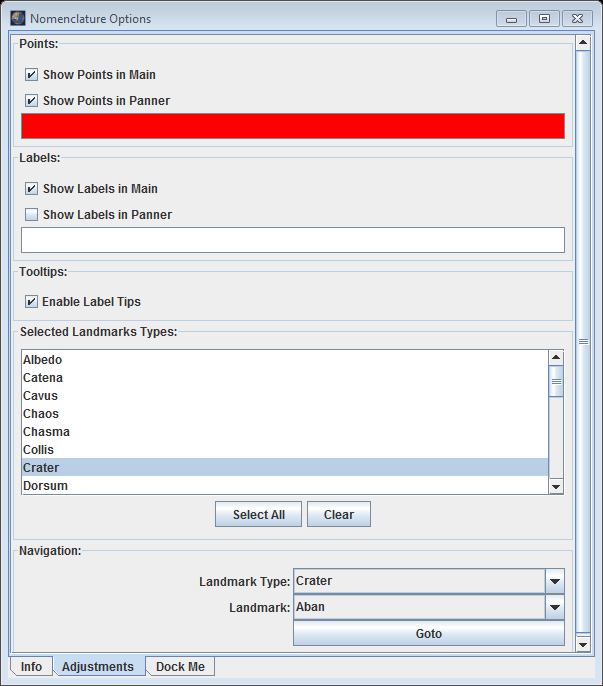 To open the Nomenclature Layer, go to the Layer Manager and click Add New Layer -> Nomenclature. Then click on the "Nomenclature" tab at the top of the Layer Manager. All of the settings will be pre-set to appropriate values. Advanced users can change them if they would like. To see all the feature names in the Viewing Window, click on the "Select All" button. Points will appear in the Viewing Window at the center of each named feature with the appropriate name next to it. To only view names for certain types of features (ex: mountains or "mons") click on a landmark type in the list of landmarks. 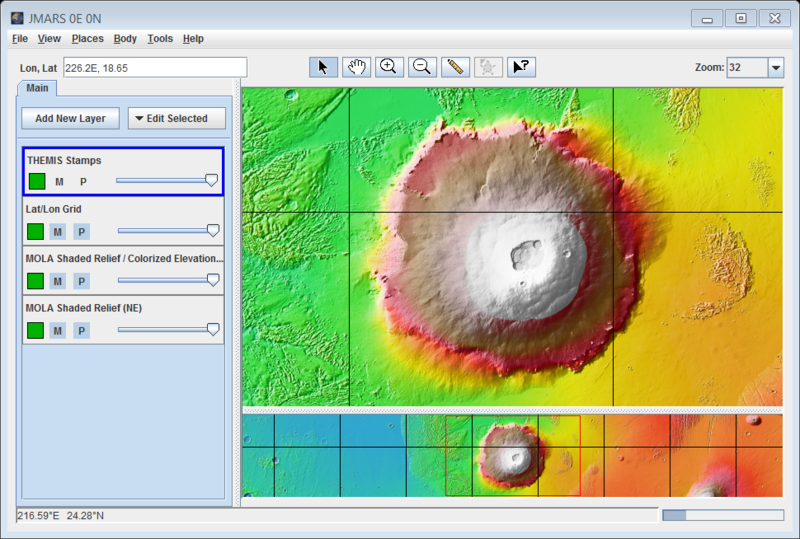 To center the Viewing Window and a particular feature (ie: Olympus Mons), select the landmark type from the list (ie: Mons) and then select the specific feature (ie: Olympus Mons) from the "Landmark Types" drop-down menu at the bottom. Then click "Goto". If your students are interested in taking an image of a specific area (ie: Olympus Mons), it can be helpful to look at previous images of the same location. To start, we'll open the THEMIS Stamp Layer by going to: Add New Layer -> Stamps -> THEMIS Stamps. Under "Image Type", choose "VIS"
Depending on the area, there may be so many outlines that it is hard to tell them apart. To help with this, click on the "THEMIS Stamps" tab at the top of the Layer Manager and then click on the "Settings" tab at the bottom. Adjust the "Fill Alpha" slide bar to about the midpoint. This will make the stamps only semi-transparent and much easier to tell apart. To find a specific image, you may need to use the zoom pull-down menu in the upper right of the Viewing Window to zoom in more (ie: 64 or higher). To view a specific image, select it by left-clicking on it. (The outline will turn yellow.) Then right-click on it and choose "View THEMIS Stamps" -> "Stamp V########" -> Web Browse V########". The image will open in a web browser. V######## is a THEMIS image ID. Each image has its own ID number, so this will vary depending on what image you select. If you right-click on an area where multiple images are overlapping each other, the "View THEMIS Stamps" menu will give you the option of viewing all the THEMIS images which cover that point. Now, to prepare for the last step of this tutorial, we are going to temporarily turn off the THEMIS Stamp layer without deleting it. In the Layer Manager, click on the "Main" tab at the top. 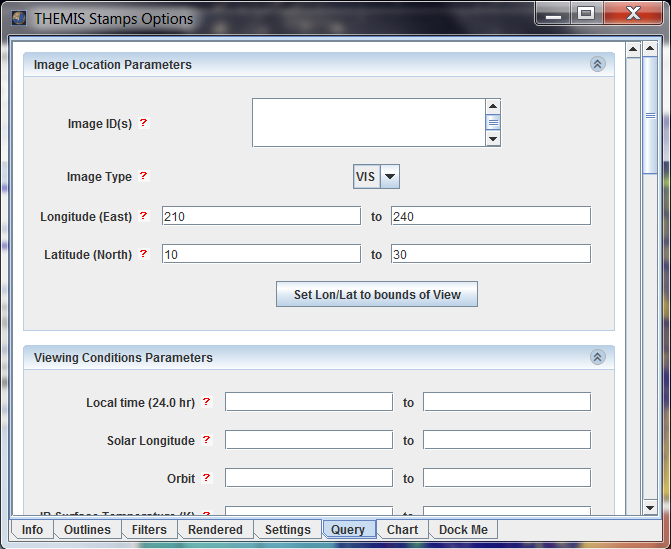 Click on the "M" and "P" to the left of "THEMIS Stamps". Even though the Stamp Layer is no longer displayed in the Viewing Window, we can bring it back later by just clicking on the "M" and "P" again, without re-entering all our search parameters. In the Layer Manager, click on the "ODY Groundtrack" tab at the top. It will only display groundtracks for a certain time range, so you will need to enter a start and end time. You can ask the MSIP instructors for an appropriate orbit range when your students are ready to begin looking for potential targets. For example, enter orbits 29801-29836 and click "Update". 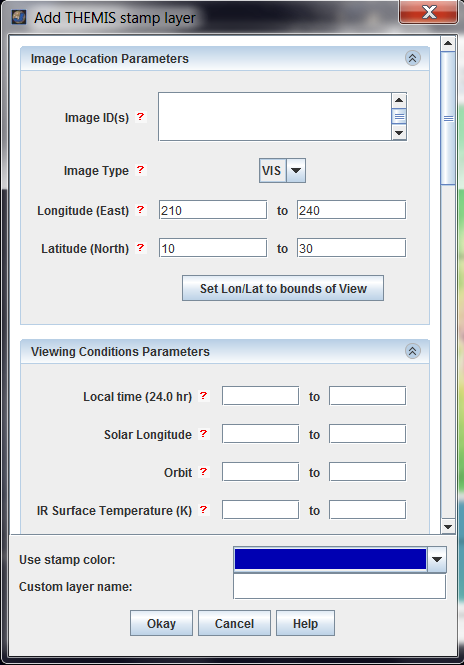 JMARS will display daytime and nighttime groundtracks, but since the VIS camera only uses visible light, images must be taken on the daytime groundtracks. In the figure below, the daytime groundtracks (which always slant upward from left-to-right) have been colored green and the nighttime groundtracks (which always slant downward from left-to-right) have been colored red. The last step is to figure out where images have already been taken, since we usually try to avoid repeating observations (unless we are specifically trying to monitor surface changes). To do so, we are going to open the High Quality Coverage Map by going to Add New Layer -> Maps by Instrument -> THEMIS -> Coverage -> Quality VIS Sum 1 -> Quality Fair Visible Summing=1. In the Layer Manager, move the "Quality Fair Visible Summing=1" layer below the "ODY Groundtrack" layer so you can see the groundtracks more easily. You can see that after focusing on Olympus Mons for years, we have built up a lot of high-quality coverage. However, there are still some large gaps along the daytime groundtracks. Targeting your image in one of those gaps would ensure that your students would get an image of Mars that has never been taken before. Congratulations! You've completed the Using JMARS for MSIP Tutorial!